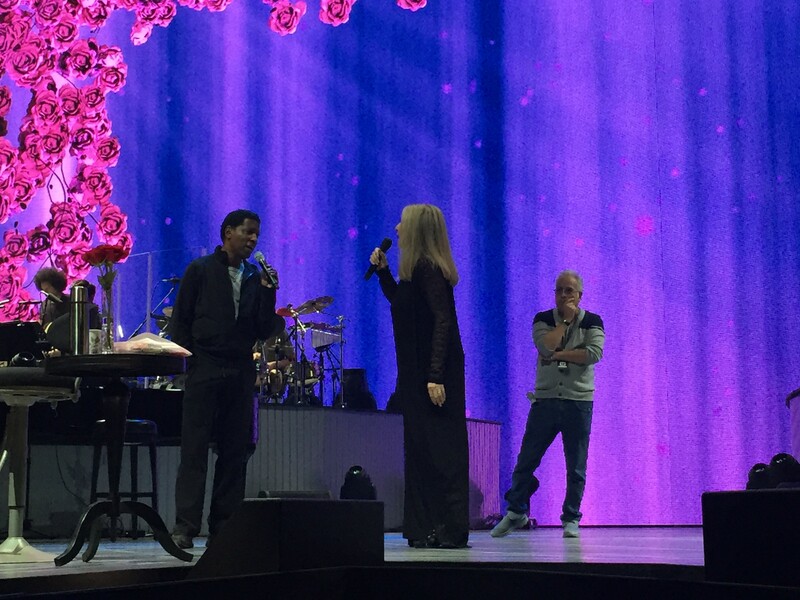 Barbra arrived at The Los Angeles Staples Center at 5pm and spent an hour working through some arrangement ideas she’d been thinking about since the previous evening’s “Friends and family” dress rehearsal concert. In-between conferring with musical director Randy Waldman, she reviewed some staging notes with her co-director Richard Jay-Alexander. Most of the people we affectionally call “Team Barbra” have worked with her for decades, so their communication is done via a kind of linguistic shorthand that allows decisions to be made quickly. After two hours we had to vacate the stage so ticket holders (AKA the luckiest people in the world) could enter the arena. The “concept” of ACT I is to celebrate Barbra’s six-decades of #1 albums by performing famous songs and much loved “deep cuts” from each of them. Several are ones she’s never performed live on stage before, which is a treat for her as well as the audience. She was in glorious voice, and shared some fantastic stories that not only illuminated the songs, but also brought to life her iconic record covers. It’s really true that every picture tells a story. The debut concert had three special guests, and each brought their own magic to the evening. 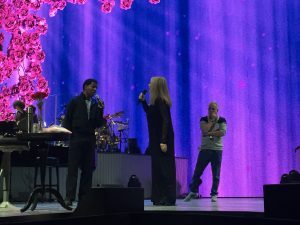 First, Barbra’s co-producer on “Partners,” Kenny “Babyface” Edmonds took to the stage and they performed their exquisite duet version of “Evergreen”. Kenny’s vocals quite literally melted into Barbra’s. Superb and sterling are only two of several alliterative descriptions that come to mind. Later, the multi-talented actor/writer/director and singer Seth MacFarlane and Barbra crooned a heartfelt version of “Pure Imagination” (the Anthony Newley/Leslie Bricusse classic written for the movie “Willie Wonka & The Chocolate Factory” and currently featured in the hit West End musical version “Charlie & The Chocolate Factory”), which they’ve recorded as a duet for Barbra’s new album “Encore.” In acknowledgement of their the mutual concern for environmental issues, Barbra turned the song into the ultimate wish fulfillment fantasy about what the world should and could look like. The two singers were framed by a wall of magnificent visuals, giving the song an added dimension that has to be seen to be fully experienced. The emotional impact of Barbra’s vision is palpable. Imagine Dorthy Gale’s journey from the grey skies of Kansas into the wonderland of Oz as a reference point for this set-piece. 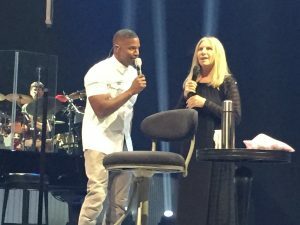 In ACT II, Barbra and another of her duet partners from “Encore” – Jamie Foxx — performed an impassioned version of “Climb Ev’ry Mountain” (from “The Sound Of Music”) that brought the audience to their feet. If I had a crystal ball (and maybe I do!) I’d say there’s a good chance their recording of Rodger’s & Hammerstein’s classic will become a Grammy contender for “Best Duet.” Barbra would never say (much less think) something like that — but I would! After the show, the wrist-band crowd (my term for Barbra’s many friends and admirers) were ushered backstage into the inner sanctum (Barbra’s dressing room) for a little post show tête–à–tete: Among those I saw pass through the portal, Rosie O’Donnell, Dustin Hoffman, James Corden, Bill Maher, Peter Bogdanovich, Quincy Jones, and Marilyn & Alan Bergman. There were many others I’m not recalling at 2:30am! Throughout the tour I’ll be posting updates — not only about the show, but also the occasional peek behind the curtain if there are any noteworthy pre and/or post show activities.